Black List API provides a solution for the traffic and its sources testing when there is no option of using active testing tools such as Sites, TrackingTag, AdManager, and Redirector. The effectiveness of this tool is based on historical visitors’ data and the domains that have been tested earlier by the WhiteDiagnostic system. We strongly recommend using it in tandem with the active traffic inspection tools – so that you get the maximum impact when using our system. 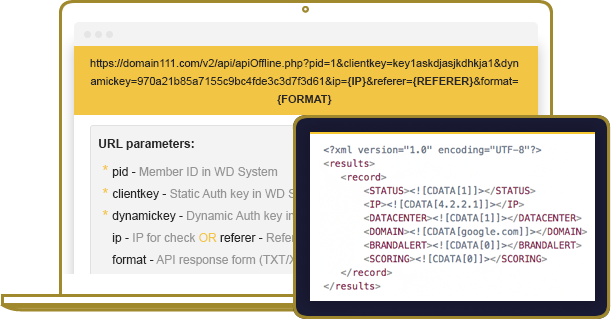 Two Black List API access keys, which are transmitted to the URL. 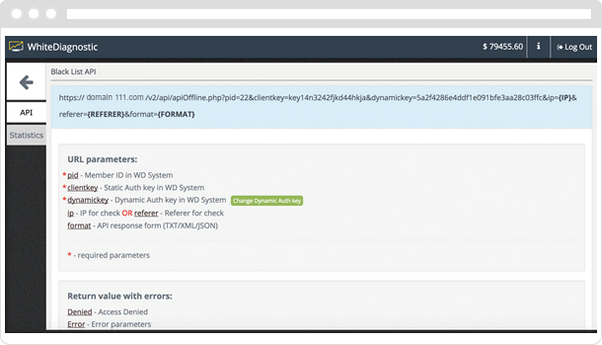 These keys are generated during registration in our system and can be changed anytime. After generating the new keys, the old ones will stop working within 5 minutes. To get more information on IP or Domain, you need to transmit them to the Black List API via the URL request as GET-parameters: &ipor &domain. You can transmit only one parameter for testing, either the IP or the Domain. If there are both parameters in the request, the priority will be given to the IP testing. In response to your request, there will be information on whether the IP or the Domain is registered in our database. If the data on the requested object exists, you will get a quality assessment of the IP or Domain according to our evaluation (scoring) scale between 0 (perfect) and 999 (very bad). In the case of the Domain related request, you will be provided with the additional information on whether the site subject refers to the categories that include harmful content which can have an affect an advertised brand.